Many investors, particularly those who are new to the stock market, are totally unaware that there are different order types. So they simply call up their broker and tell him that they want to buy a given stock, bond, or ETF. And the problem with that? Unless you name a specific price, you’re giving your broker permission to fill your order at any price. The good thing is that you’re guaranteed to get filled as long as there’s trading activity – meaning buyers and sellers making a market. It’s the price that’s the problem. Would you go to your favorite store and tell the salesperson that you’ll take those jeans at any price or head for the gas station to fill up for whatever the pump jockey wants to charge you? No way – you don’t want to get ripped off. Doing so takes away the advantage afforded to the much bigger traders who hold most investors at the mercy of the markets. It also removes the threat of being played by hedge funds, unscrupulous market makers, and institutional traders who would force you to buy your shares more expensively than you would otherwise. As I write this, Netflix Inc. (NasdaqGS:NFLX) is trading at $116.18 per share. The best bid – meaning what somebody will buy it for – is $116.17. The best ask – meaning what somebody will sell it for – is $116.20. But there are also orders out there for as little as $100 and as much as $130 a share. If you want to buy 100 shares of Netflix and you don’t specify a price, your broker could execute your trade anywhere in that range. So you could potentially spend as little as $10,000 or as much as $13,000. The next trade could be anywhere in that range. It could also be dramatically outside that range. Let’s say there’s a technical glitch – which we’ve seen happen several times in the recent past – and the best ask on the book is $200 a share. If you put in an order to buy at market, your trade will execute at $200 and you will have spent $20,000, which is probably not what you intended. If you’re a seller, the same risks apply. If there’s a glitch or you’re trading after hours in thin markets and you simply say sell, you could get the $200 a share or your trade could go right to the $5 a share “lowball” order a guy like me put out there just to go fishing. Limit orders are almost always the better way to go. Here’s another example using a more conventional price chart rather than the Level II data I’ve just highlighted. Imagine XYZ trading at $84 a share. Buyers interested in a bargain may stipulate that they’ll pay no more than $80 a share, while sellers interested in maximizing gains may stipulate that they’ll sell for no less than $88 a share. Effectively, they’re establishing a range. That’s important because you should never want to buy something badly enough or sell in such a knee-jerk reaction that you’re chasing a trade. That’s a losing proposition no matter which way you cut it. The order is routed to the limit order book, so it’s known and everybody sees it. The order is guaranteed to fill at a given price that’s defined in advance so you’ll know exactly what price you’ll get. The risk is that your order may not be hit in fast-moving markets because the limit no longer applies. For example, if Netflix jumps 18% like it did following yesterday’s fabulous earnings report, anybody who specified that they want to buy shares at $114 or less will be left out in the wind and their order will not execute unless the stock returns to that price. Sometimes that happens. Sometimes that doesn’t. Either way, you simply adjust your order or move on to another stock because the one you want has gotten too expensive. Order are like tools: you want the right one for the job. Market orders leave you at the mercy of the markets and larger traders because you have no control over the price you’ll get. The simple, easy-to-use way around this is to use a “limit” order that specifies how much or how little you want to pay to the penny… ahead of time. Either you get that price, or the trade doesn’t happen. Obviously, we’ve just scratched the surface here – there are as many order types as there are ways to serve coffee at Starbucks. We’ll cover those in due course, along with all sorts of variations including everything from the big three – market, limit, and stops – right up to those that may as well be an alien language – FOKs (fill or kill), IOCs (immediate or cancel), and GTCs (good till cancelled). In the meantime, I want you to get in the habit of specifying price every time you place an order. That way you’ll trade on your terms and, in doing so, dramatically increase your profit potential. I have not had profitable experiences over many years in the stock markets. I find I want more control (and profits) from my investments. I have found that in a limited set of investments. Your stock trading explanations are very helpful and I realize that my penchant for control is really need to a to know more and be educated. Thank you, please continue to educate us all. I enjoy your comments and examples. Some day I would like to meet you in Portland for a meeting. Thank you for the extra advice that you offer. I use Schwab with (stop) limit buy orders. Being the novice that I am, in fast moving markets, I’ve learned it’s prudent not be trigger happy and emotionally attached, and to look at more than just price or preferred price rang (volume, fundamentals, history, etc.). So even though I bought EKSO on a limit order when it dropped, I’m down and holding, hoping that the long-term outlook will improve. On the other hand, this is not the case on a more recent trade with a pharmaceutical. You state that you’ve just scratched the surface, so my obviously simple question is, there must be a way to play both ends — long and short. For example, if I put place a limit order to buy on a drop, suppose that I also want buy at a specified price if the stock price rises. This would be akin to a straddle position (my own make-up word here). Is it two separate orders, which seems dumb, or can it be combined so it is either/or depending on which triggers first and thus cancelling the other? Perhaps this is outside the conversation, but I’m curious. That way is my bible. I believe these tutorials are very helpful to those of us that are journeymen. Being of limited means, I wish I’d known about limit orders before. I would like to know a bit more. How long are they in effect, and do they cost more to place than market orders via internet? I have always gotten the very worst price, but in addition of the my 2 accounts (Schwab and Fidelity), I’ve learned that Fidelity does not sell partial shares whereas Schwab does – and the profit can be considerable. Because I am only able to purchase a small number of shares, essentially I’ve lost my dividends. What happens to the partial shares when Fidelity does not sell them and they expire worthless when the share price drops? Thanks for your excellent educational value. I believe the Fidelity system does not show the sale of the fractional shares as pending (or sold) when you sell all your shares, however you do get the money for those fractional shares when the trade settles. This happened to me once so I called them to ask and then checked the account history after the trade settled (usually in 3 business days) to make sure. Hope that helps. At Fidelity fractional shares do sell, if when you put in the order you specify “Sell All Shares” instead of just “Sell”. It may not show up immediately as the fractional share part of the sale will take a few days to clear, but you will get the proceeds from them. OUTSTANDING INFORMATION! This is the type of information I have needed. Now, how to go back and learn about all you have taught before this gem. Great article Keith, this gave me more knowledge and reminded me of how to trade smarter. The money saved can be considerable, especially if you’re trying to build a retirement nest egg. Keep up the good work and sharing your knowledge and expertise. Thanks again. This article hits the nail on the head for me. As a novice investor ( I know enough to to bankrupt myself ) I don’t know enough about orders and how to apply them successfully, so thanks for the info. Will keep watching for the followup article. 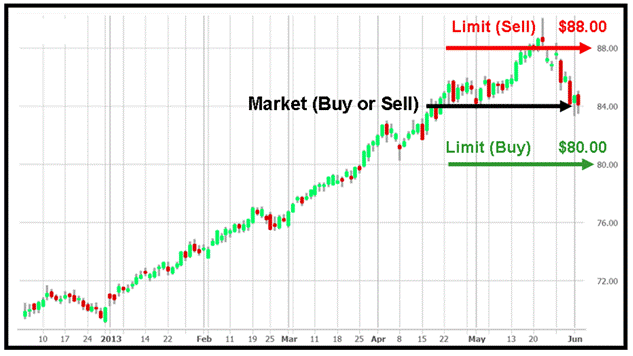 Limits also work well with options and spreads. Fidelity shows the bid, ask and mid-range graphically when you are putting in a trade. Thanks Keith for that brief refresher course! Some of us need more help than others. It makes me feel good that there is somebody out there who really tries to think what is in our brains. How do inexperienced investors think? What do they know? These are the questions you ask and answer for us. Does me feel good that you are getting so many praises and good comments from others. We appreciate what you teach us! KEITH…..THE STOCK I AM LOOKING FOR IS A BIO TCH ….READY TO BREAK OUT….A SMALL CAP STOCK,THAT COULD MAKE GAINES OF720% as it serves CALIFORNIA. lOOK FORWARD TO HEAR FROM YOU.